Today is just another Thursday of being unemployed. What have I been doing these past few days, uh...weeks, um..month or so of being unemployed? In between flipping back and forth through the Gainesville Sun and Independent Florida Alligator's help wanted advertisements with no such luck, and clicking endlessly through scams and get-rich-quick-schemes on Craigslist, I've been utilizing our Blockbuster movie pass. So this Thursday was no exception. There I sat in our wonderfully frigid apartment in the typical unemployed attire of sweat pants and an old t-shirt with some morning coffee watching the latest of my rentals: Danny Deckchair. 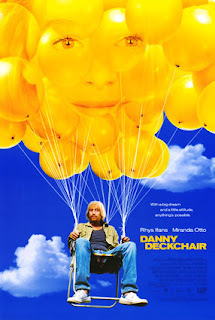 My roommates called me mentally handicapped in not so many words for my choice in movie, but Danny Deckchair was in fact a Blockbuster employee favorite and everything about the box cover, name, and description on the back tickled my Chuck-fancy. It's a little known movie with a cast of unknowns but once I made it through the first 20 minutes or so when the movie "takes off"...that's actually a play on the tagline and plot...anywho, once I made it to the meat of the movie I became enthralled by the adventrous idea of just ending up somewhere unfamiliar and re-inventing yourself. Similar feelings were stirred up from watching The Hudsucker Proxy and that Michael J. Fox classic The Secret of My Succe$s. The idea is nothing new to my imagination or to the main plots of many movies. I've always been one to fall back on the infamous phrase "I need a clean slate". So this posting I guess could be a movie review, but it has developed into the ramblings of a man who has no real direction, but he's searching - albeit lackadaisically - for his new beginning. I'm not sure watching a movie about a guy who travels by a deckchair tied to a bunch of giant helium filled balloons to another part of the U.K. is exactly the boost he [ I ] need(s), but at the least it excited his [ my ] imagination. call an experienced professional to assist you in fixing your sewer. Use your brain. Vote McCain.